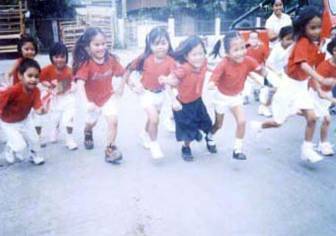 There were many activities throughout the school year 2004-2005 of AMSAI Mindanao and we would love to share these nice experiences.At AMSAI schools in Davao, every year there is a calendar of monthly programs which help to engage the teachers, parents and students in activities that enhance the existing academic programs. Activities such as Nutrition Month, Filipino Day, Family Day, United Nations Day, Environmental Month, Sports Fest, etc. serve as a platform to forge close coordinated cooperation among the teachers, parents and their families, in moulding the child’s mental, social and spiritual growth. To promote our vegetarian diet to the parents and to introduce them to a healthy lifestyle, in July we had a nutrition month program with the theme from the government program “The importance of breastfeeding”. A cooking demo was performed by Sister Amrta and Sister Amita from the Sisters Training Centre. A food preparation contest was also held which involved the parents and students, trying to outdo each other with a nutritious and delicious cook out of vegetarian dishes, which were beautifully presented before the judges. No wonder the judges had a hard time deciding which group would be the winner! A lively affair complemented with children’s singing, poems, and very useful information on breastfeeding from the guest speaker. “Linggong Wika” or Filipino Day was celebrated with a bang in August at AMSAI Atis, Mateo and Digos. 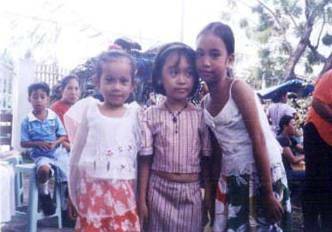 Children in their traditional Filipino and colourful garbs added patriotism to the event which is held to commemorate the citizens of the country giving importance to Wikang Filipino as the national language by unitedly using and loving the language. 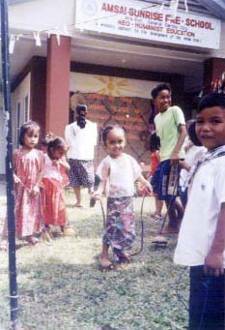 There were dances, folk song renditions, singing, dancing and choral recitation by the children followed by Filipino-style games. It was a “Bayanihan spirit” (one of Filipino trait, meaning friendship by helping and working together as one) where the parents also put up booths with Filipino products and food exhibits, adding to the colourful celebration. 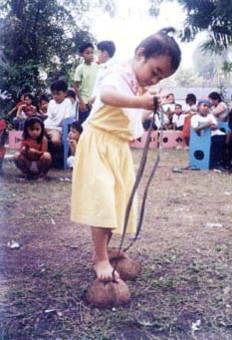 It has been a very good activity for kids to learn about their own beautiful culture. September’s activity was Family Day. It was the first time that we had a parent seminar workshop. The topic was “Your child and Neohumanist Education” to develop the understanding of the parents and how they can support the child in the Neohumanist way. Mrs. Ciencia Y. Plaza, Dada Mantrajapananda and Didi Ananda Carushila were the speakers in the workshop, touching on the science of child psychology, morality, spirituality and Neohumanist philosophy. It was an interesting program for the participants, which prompted the parents to request another whole day seminar for learning meditation and yoga. The environment was given prominence the Neohumanist way, in the Environmental Month celebrated in November with tree planting. The children in AMSAI Digos planted vegetables “okra and eggplant” at the backside garden of the school. In AMSAI Atis and Mateo they also learnt how to do sprouting.A variety of dance, chorus recitation, Christmas songs and parlor games were part of the December Christmas party in AMSAI schools. The children were very excited with the nativity-drama “Story of Jesus”. It was their first performance and with the help of the parents the children could perform it nicely. Our PTA became the Santa Claus complete with the costume, which made his own child wonder where his father was. The Sports Fest in January where the children had a Field Day in sack race, 50 m dash, slippers relay, asanas and beautiful Callisthenics. 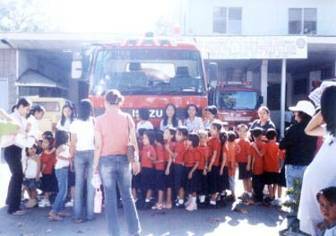 They also played games such as Trip to Jerusalem, Bottle Filling and Statue Dance with prizes awarded to the winners and losers as well.An educational field trip was organized in February with a visit to the Fire Station. The children were so amazed when they saw the firemen slide down the sliding pole. They also visited the Post Office and the Radio Station DXCP of General Santos City. At the radio station the children were given airtime to recite a poem “All things bright and beautiful” and to sing songs from the Circle of Love. Next stop was the Orphanage and Yusepeng Zoo where the children were excited by the sight of a large snake. The field trip gave the children an opportunity to learn things outside of school. never ever destroy God’s creations and begs them to take care of them. (The children complement the story with rendition of an equally beautiful poem “All things bright and beautiful). Everybody enjoyed the drama very much.It has been a great experience to be involved with the activities of AMSAI !!! And so May opens the schools for enrolment and new intake of students for another year of joy and learning adventure!